The US trade deficit keeps widening despite President Donald Trump’s anti-trade, protectionist stance. The deficit with China surged 16.7% in January to its highest level since September 2015. 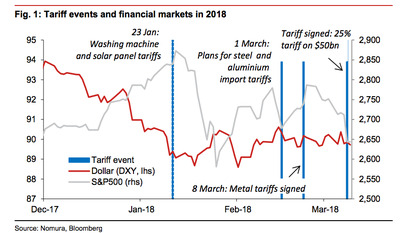 “The trade numbers over the last quarter of 2017 deteriorated sharply, suggesting 2018 could see a larger deficit,” write Nomura research analysts Bilal Hafeez and Sam Booney in a research note. 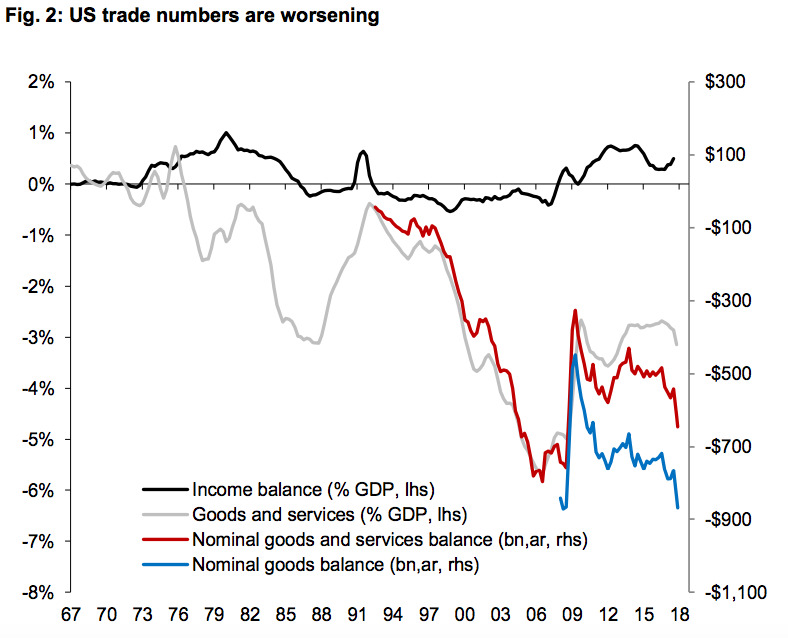 For most economists, a large US trade deficit is the natural and sustainable product of a very large consumer-driven economy that imports a lot of its goods. To Donald Trump and his economic team, the deficit is a scourge punishing US manufacturers, and it must be addressed with aggressive protectionist measures like unilateral tariffs on key imports – despite the widespread threat and fear of retaliation and the rising risk of a trade war. Here’s the irony: the harder Trump & Co. push, the more the deficit seems to widen. The trade gap surged to a nine-year high in January, with the deficit with China surging 16.7% to $US36.0 billion, the highest since September 2015. The US trade gap with Canada was the biggest in three years. Trump officials argue that these deficits were years in the making – and will thus take time to unwind. 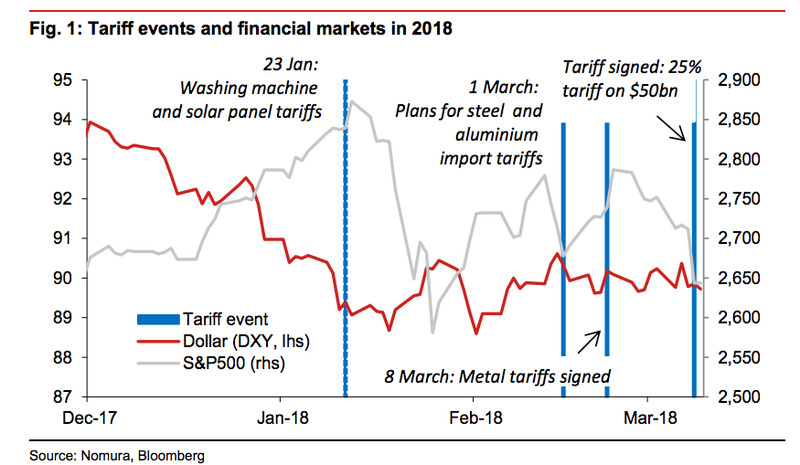 And investors have actually been surprised that Trump held off this long on imposing tariffs considering his heated anti-China rhetoric during the campaign. 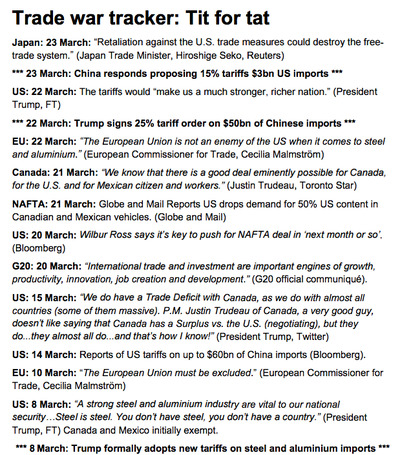 Still, the charts from Nomura show just how much the trade outlook has worsened in recent months, as evidenced by the war of words between key trading partners, as well as the incipient negative market impact of the negative trade rhetoric. One of Trump’s first steps as president was to withdraw the United States from the long-negotiated TransPacific Partnership agreement with 11 other nations and threaten a pull-out of the North-American Free Trade Agreement pending extensive renegotiations. 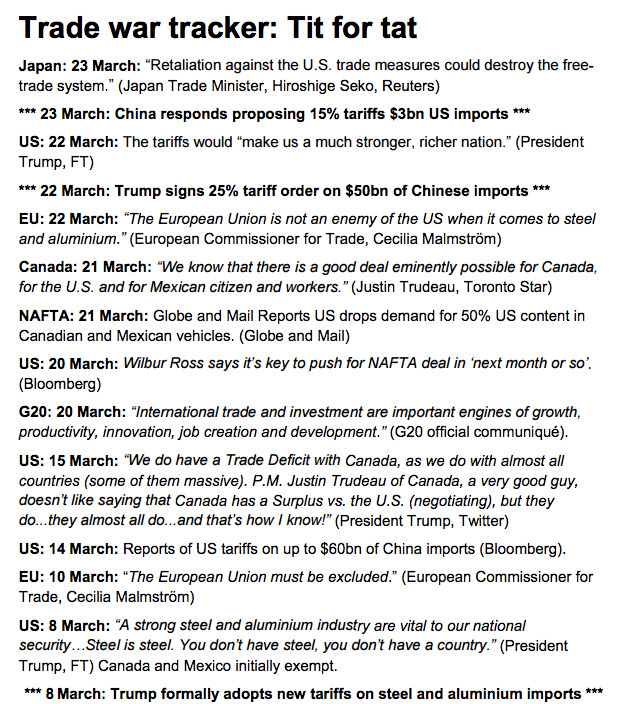 More recently, Trump announced tariffs on steel and aluminium imports that irked US allies, as well as targeted tariffs on $US60 billion on Chinese imports. China has vowed retaliation.